In the Central Andes (Bolivia) and the Western Carpathians (Slovakia) Sb-(Au) deposits are of wide-spread occurrence. They may be subdivided into two principal types: (I) shear zone-hosted and (II) stockwork-like Sb deposits. Type I Sb deposits are widespread in fine-grained metasedimentary, granitic and gneissic rocks. Type II is only found in volcanic rocks and may be further subdivided into acid sulphate-type (IIa) and low sulphidation-type (IIb). This more subtle classification is based upon the presence or absence of sulphate and K feldspar and applied in the same way as for epithermal Au deposits elsewhere. Type III is a composite vein type transitional between types I and II Sb deposits. Mesothermal deposits (type I) were emplaced syntectonically and synmetamorphically under low grade to very low grade stage metamorphic conditions. The mineralising fluids are likely to have been derived from crustal sources through devolatalisation. Epithermal types (IIa) and (IIb) are related in time and space with the formation of acidic to intermediate (sub)volcanic rocks of Miocene age. To distinguish the various types of Sb mineralisation, Bi, Ag, As and Hg have proven most diagnostic. These elements are anomalously enriched in the volcanic-hosted types IIa and IIb, whereas type I mineralisation are poor in Bi, Ag and As. The element contents of these trace elements in type III deposits vary according to the position of the host mineralisation relative to the Tertiary igneous rocks. Hg tends to be enriched in type II mineralisations. Even so there are also some Sb mineralisations of type I abundant in Hg, possibly due to tetrahedrite intergrown with stibnite. 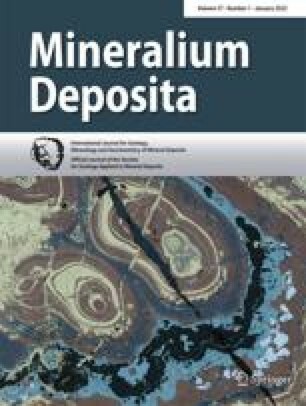 In contrast to porphyry copper deposits, Sb deposits are distal relative to the subduction zone. They are confined to sections of the fold belt where the continental crust is thick and was subject to strong horizontal displacements. The ratio of horizontal to vertical crustal movements during the structural evolution of the fold belt and the resultant skewness of the geothermal gradient played a decisive role for the type of volcanic-hosted Sb deposits (types IIa and IIb) to develop and to what extent composite stibnite deposits (type III) evolved.